Heeling can be a problem or technique - find out why. Sometimes boats don't sail completely flat - this is called heeling. 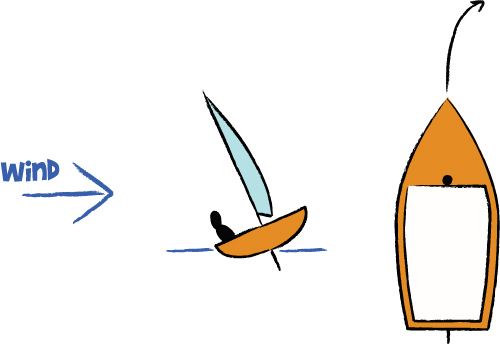 It can be a problem or a technique; using the rudder is not the only way to steer a boat; you can use the boat itself to help! Why would you want to use the boat to steer itself, rather than the rudder? There's a number of reasons, but first, let's learn how to stop the boat heeling, and why we shouldn't let it heel. To get the best speed when sailing, the boat should be completely flat - the boat then has the best shape in the water, and will not affect the course you are steering. There are several ways to get the boat back to the flat. The main way, and the way most beginners are taught, is to depower the sail, by easing the main sheet, or turning off the wind (luffing, or heading into the wind). 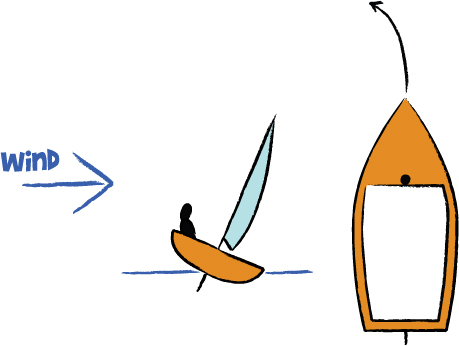 The other way to get the boat back upright, is by using body weight, by moving more weight over the windward side of the boat, by leaning or hiking out. Or, if the boat is more advanced and higher performance, by using a trapeze to hike out further. When hiking out, it's best to Ease, Hike, Trim. That is, when a gust hits and heels the boat over, ease out the sail first. Then, when you and the crew are ready, lean out to balance the boat as you trim the sail back in to bring the power back on. This technique gives better speed than just letting the power build up, the boat heel over, and you lean out to bring it back up flat. Now you know how to stop the boat heeling, let's learn why we should let it heel! A heeling boat turns. Yep, without you using the rudder. Why is this a good thing? Firstly, every time you use the rudder, it slows the boat down slightly by causing more drag. Secondly, you may not be able to point any higher up towards the wind using the rudder, but by using this effect called heeling, you can get just a little more angle up into the wind and may be able to make that mark (bouy) after all! In Picture 1, the crew are sitting on the windward side of the boat, heeling it to windward. This changes the amount of the hull in the water, and the shape of the hull in the water; this causes the water under the boat to flow differently, and makes the bow turn away from the wind. In Picture 2, the crew are sitting on the windward side of the boat still, but are heeling it to leeward. This changes the shape of the hull in the water differently, and makes the bow turn towards the wind. This is sometimes called curving the boat, and can help you reach a higher point than you usually would be able to.